Crystal Palace vs Manchester City, EPL 2018–19 Live Streaming Online: How to Get English Premier League Match Live Telecast on TV & Free Football Score Updates in Indian Time? Manchester City travels to Selhurst Park which has often been a potential banana skin for top sides over the years. 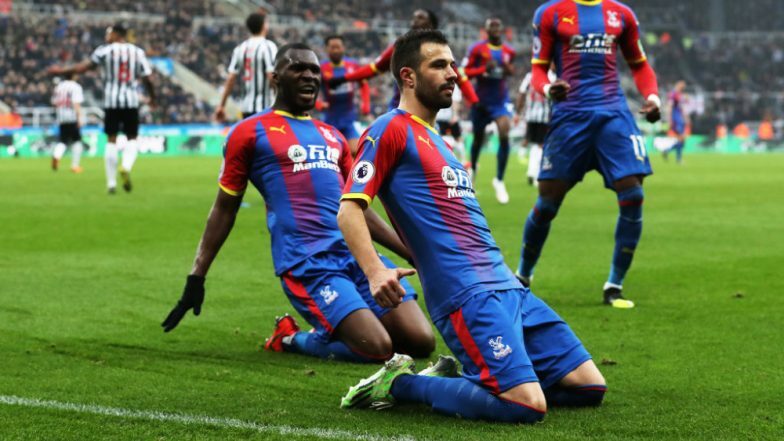 Crystal Palace have all but guaranteed themselves top-flight football next season with a win over Newcastle United. With eleven points separating them and the relegation place, they may be slightly more relaxed facing the defending champions. Pep Guardiola’s men have been on an eight-match winning run in the league and despite a setback in Europe, they will come to all guns blazing against Palace. Crystal Palace vs Manchester City Live Football Score. Leroy Sane and Kevin De Bruyne were overlooked in the defeat against Tottenham Hotspur in the Champions League and the duo should return to the starting eleven. Olexandr Zinchenko is still injured and in his place, Benjamin Mendy could start. Sergio Aguero missed a penalty in the last game but the kind of form he has shown in the league, he picks himself up virtually every game. In defence, Aymeric Laporte and John Stones form a solid partnership that can withstand the test against Palace. Wilfried Zaha has been the player of the season so far for Crystal Palace and he is one player that has the potential to stretch the City defence. Andrew Townsend who scored a beauty in a shock win over Manchester City at the Etihad in the first half of the season will be Zaha’s go-to man on the field. James Tomkins is a doubt for the game with a groin injury which could be a massive blow to the hosts. His unavailability in addition to that of Mamadou Sakho severely cripples their backline and Roy Hodgson may be forced to go for changes. Manchester City may have had little rest prior to this game but they have the quality in the squad needed to get over challenges posed by teams like Crystal Palace. When is Crystal Palace vs Manchester City, EPL 2018-19 Football Match? Know Date, Time and Venue Details. In the English Premier League (EPL), Crystal Palace and Manchester City face-off on April 14, i.e. Sunday. The football game will take place at the Selhurst Park, with the start time of 06:35 pm (IST). Where to Watch the Live Telecast of Crystal Palace vs Manchester City, EPL 2018-19 Football Match? The official broadcaster of the English Premier League in India is Star Sports. So the fans will be able to catch Crystal Palace vs Manchester City live match action on Star Sports Select 2 and Star Sports Select 2 HD channels. How to Watch the Free Live Streaming Online and Football Score Updates of Crystal Palace vs Manchester City, EPL 2018-19 Football Match? If you are looking where you can watch the online streaming of the match, then you can log on to Star Sports' live streaming service, i.e. Hotstar. You can also catch Crystal Palace vs Manchester City live football score updates on LatestLY, by clicking here.